I have trek portfolios also in , treknature and trekearth . Lovely cat and nice detail! Good sharpness! Merry Christmas to you and to Karen, too! Merry Christmas, An original image with the Kitty. Linda macro deste gatinho lindo. Feliz Natal com amor e paz. 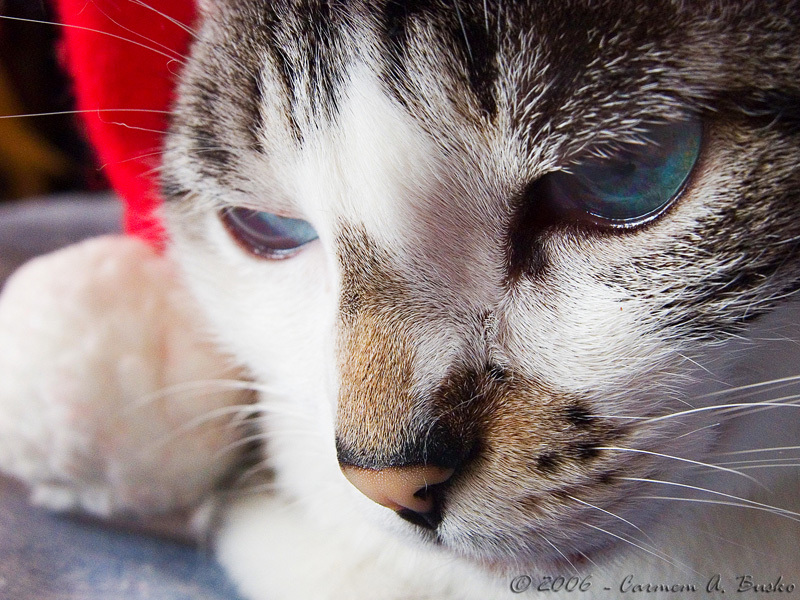 The sharpness is exquisite here with a great POV of this beautiful cat in a dreamy mood. Love the shallow DOf and close perspective- well exposed and presented shot. The copy wright logo is a bit too big for my taste but this is a personal thing and does not detract from this fine image- well done and TFS! Voc� substituiu o arminho sint�tico dessa festa sint�tica e comercial pela pelagem da gata e fez uma pequena concess�o � �poca com uma mancha vermelha que deve ser de um gorro natalino. Grande foto e que belos olhos tem essa gata. Uma charmosa felina, como todas elas s�o !!! Feliz Natal, Carmem. Que em 2010 suas inspiradas composi�oes continem a ser postadas para nossa alegria,amigos do TL! Amazing and beautiful eyes Karen has. Very good details of the fur and whiskers and the santa hat's red color adds a nice touch of festivity.